CSRS and CSRS Offset Federal Employees have a unique benefit called the CSRS Voluntary Contributions Program. The big deal with the CSRS VCP is that you can use it to max-fund a Roth IRA. But not very many people have heard of it. In the book, I cover everything you need to know about the CSRS Voluntary Contributions program. And I give you step-by-step instructions how to transfer money from the VCP to an IRA. Tammy Flanagan, Senior Benefits Director of the National Institute of Transition Planning, Inc., was kind enough to write the foreword to The Best Kept Secret in CSRS. Micah Shilanski is the best person I can think of to write about the voluntary contributions program. Micah has a heart for the federal employee and is truly committed to helping employees prepare for a financially secure future. Micah is an accomplished financial advisor who takes advantage of modern technology in his practice and strives to provide clear information to help his clients take charge of their future. 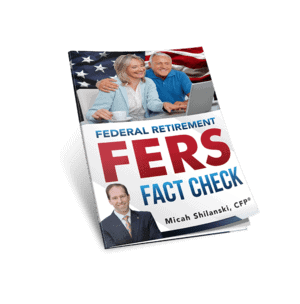 This publication is a further example of how Micah took the time to thoroughly analyze the benefits of the voluntary contributions program for federal employees covered by the Civil Service Retirement System and lay out the details of this program in a way that anyone can understand. Why write a book that only 10% of the current federal workforce will need? It was a good idea because if you are one of the remaining employees covered by the CSRS, then you need this information. Micah saw a need and he filled it when he put together the first edition of “The Best Kept Secret in CSRS.” Now, Micah has expanded and improved his first edition to share his experience with other federal employees, like you, who have learned of the advantages of participation in this unique investment opportunity. Although the Office of Personnel Management provides information about this program at www.opm.gov, you will not find information there about using this program as a financial planning tool to help you achieve your retirement goals. Micah will walk you through the mechanics of getting your money into and out of the voluntary contributions program so that you will be able to use these funds in ways that you were not aware were possible. I met Micah several years ago when I came to Anchorage to present a retirement class to federal employees working in Alaska. I asked Micah to help me explain the transition from COLA to Locality pay which was something new for the employees of Alaska and was a topic that I had very little experience. He was not only willing to help, but he did a fabulous job. Having worked with Micah – and I even had the privilege of meeting his beautiful wife, Kelly and his adorable children – I can highly recommend this publication. If you are covered under the Civil Service Retirement System (or CSRS Offset), this book is worth your time to read so that you will be able to use the voluntary contributions program to supplement your retirement savings. National Institute of Transition Planning, Inc.
Who Qualifies for the VCP? What if My HR Says I Can’t Do a VCP? How Much Money Can I Put in the VCP? How Do I Find Out How Much I Can Put in the VCP? Do You Really Need to Know the Exact Limit? What If I Contribute More Than My Limit? Should I Contribute More Than 10% On Purpose? How Do I Make a Contribution to My VCP? What Can I Do With the Money in My VCP? Where Can I Transfer My VCP? Which Transfer Option is Best? Which is Better, Traditional IRAs or Roth IRAs? Where Do You Think Taxes Are Going in the Future? What if I Make ‘Too Much Money’ for a Roth? Who… Who is Involved in Transferring Your VCP? What… What Forms Will I Need? When… When is the Best Time to Transfer Your VCP? Where… Where Can You Transfer Your VCP? How… How Do I Transfer My VCP? How long does the entire transfer take? Is there a separate beneficiary designation form for the VCP? How do I designate a beneficiary for the VCP if I die before I transfer it? What if they bring back income limits on Roth Conversions? Would it still make sense for me to look into a VCP transfer? Do I have to transfer my VCP to a Traditional IRA, and then convert to a Roth IRA? Or can I convert my VCP directly to a Roth IRA? Can I borrow money to fund my VCP? Is it legal to transfer my VCP to an IRA? I plan to retire with 35 years of service, with all my career step-increases, COLA’s, overtime, and whatever else, how do I find my base pay for each of my 35 years of service? When is the best time to withdraw and transfer my VCP? At retirement, or before I retire? Is there a minimum amount of time that money must stay in the VCP before converting to a Roth? If you’re not 100% happy with the book within the first 6 months, I want to give you your money back. If after you read the book you’re not happy with the book for any reason within the first 6 months after you buy it, I want refund the full amount you paid for the book. I’m confident that you’ll find it to be a very valuable resource on the CSRS Voluntary Contributions program. And if you don’t – I’ll refund your money. You have nothing to lose. This is the most comprehensive book available on the CSRS Voluntary Contributions Program and how to transfer your VCP money to an IRA or Roth IRA. If you’re thinking about using the VCP, but want to make sure you’re not missing anything – this book is for you. Lots of CSRS Retirement guides mention the VCP, but none of them go this far in detail about your VCP choices and their consequences. If you’re looking for a step-by-step guide to help walk you through the process, this is it. The Best Kept Secret in CSRS is an eBook; which means as soon as you purchase it, you’ll be able to download it instantly. Our eBook is in a PDF format, so you’ll be able to read it on virtually any computer. You can also choose to print it out on your own printer if you would like. The best part about an eBook – there’s no waiting for it to arrive. You can be reading it, and finding answers to your Voluntary Contributions questions within minutes of buying.